" A Ragdoll will quickly steal your heart "
The Ragdoll is a large, blue-eyed, colour-pointed cat. Their large size, blue eyes and enchanting appearance certainly make them stand out, but the Ragdoll is equally cherished for it's calm and loving disposition. Known as the "puppy cat", the Ragdoll is extremely sociable and trainable, thriving on human companionship. They are often found following their owners from room to room or quietly cuddled up on the lap of their human companions. They are extremely kind, loyal and trusting cats and make the best of pets for young and old alike. They also will get along with most other household pets with the proper introduction. Known for being an extremely intelligent breed of cat, the Ragdoll is a quick learner and eager to please. This makes them very easy to train. It is not uncommon to hear of Ragdolls that have learned to fetch! You can easily train your Ragdoll as well with proper reinforcement and rewards. This should make teaching them to stay off counter tops, not to scratch furniture, etc. a fairly simple task with the proper persistence. They are known to be a fairly quiet cat in comparison to some of the more talkative breeds such as the Siamese. 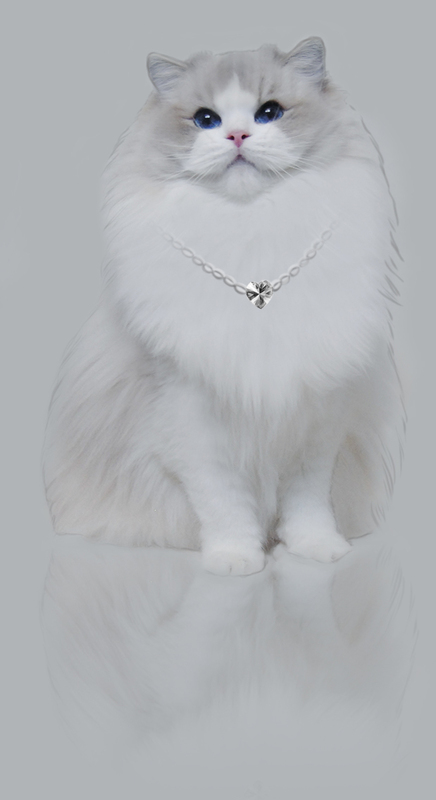 Extremely devoted to their owners, a Ragdoll will want to be part of everything you do. Although Ragdolls are a fairly docile cat, they do still love to play! Our kitties love nothing more than to bat at a cat teaser or have a little ball to carry around the house in their mouths. It is a good idea to pick your Ragdoll up some toys that will peak their interest and ensure that they get some exercise to keep in peak condition. Ragdolls are a hearty breed that have very few health issues. However, HCM (Hypertrophic Cardiomyopathy) can be prevalent within some lines. All of our cats are screened for the HCM genetic mutation prior to entering our breeding program to eliminate the risk of this disease. It is also important to keep in mind that many catteries do carry some diseases that can affect any type of cat, including any you may have at home already! We pride ourselves in taking great precautions to ensure that these diseases do not make their way into our cattery. The Ragdoll is strictly an indoor cat as their docile and non-aggressive personality makes it hard for them to fend for themselves outdoors. They are considered a semi-longhaired cat, although only require brushing once weekly due to their generally non-matting coat. Brushing is also a good way to drastically reduce, if not eliminate hairballs. Their size will usually range from 8 to 14 pounds for a female and 14 to 20 pounds for a male. Ragdolls will generally reach full maturity at about three years of age.